Master Minded, winner of the last two renewals of the Seasons Holidays Queen Mother Champion Chase, could only finished third in the inaugural running of the £50,000 Connaught Chase. The main concern for trainer Paul Nicholls was the fact that the six-year-old hung to his right throughout the two-mile contest. The Ditcheat handler said of the beaten 4/7 favourite: “Basically, he has just hung to his right throughout the race. “I had said beforehand that if Well Chief was ever going to beat us, it was going to be today given the conditions of the race and I am more disappointed by the fact that he has hung, rather than the fact he has got beat. “When we first got him, he did hang to his right and when I suggested to Ruby that we should go for the Queen Mother with him after he won his first race for us at Sandown, Ruby said no because he needs to go right-handed. “I don’t know why he has hung right-handed again today. Maybe the ground was a bit dead for him. He has had a good blow after the race. “Another day beckons now and we will be back at level weights from now on. Take nothing away for Well Chief though, that was a great performance from him. The inaugural running of the £50,000 Connaught Chase produced a memorable performance from Well Chief, who beat Mahogany Blaze and reigning two-mile champion Master Minded. A top-class chaser, Well Chief has been afflicted by a book of leg injuries, but he showed he was no has-been when second to Master Minded in the Seasons Holidays Queen Mother Champion Chase at the Festival, and today, receiving 10lb from that rival, he came out on top. Trainer David Pipe, who deserves praise for his handling of the ten-year-old, said: “I’m just the lucky person who trains him - horses that good don’t come around very often. He’s had leg problems, but he does lots of swimming and it’s been a team effort, particularly from Jonothan Lower who rides him every day. “It’s a dream come true to have a horse like this and today he did it effortlessly. I didn’t know whether he would keep going right to the post, but he did. This is what every trainer, owner and jockey is in the game for. Owner David Johnson said: “It’s a special moment because he’s come back more times than Frank Sinatra - it’s a fantastic training performance from David, and we knew the horse was fit and well and getting 10lb so we were hopeful. Whether Master Minded has run to his best I don’t know, but we’ve beaten him fair and square. Timmy [Murphy] took the inside rail and gave him a fine ride and Master Minded seemed to lug away to the outside. When we put it to him at the top of the hill to see what he had we seemed to find more. He’s a star, and to think he missed his best years through injury. It’s like having a ten-year-old car with 3,000 miles on the clock. Now I’m looking forward to tomorrow and hoping his legs are good. “He’s a 175-rated horse and they don’t come around very often so we’ve hung in there with him [through the injury lay-ups]. He’s got glass legs. He’s been blistered, had stem cell treatment and you name it he’s had it - it’s amazing he’s still walking. 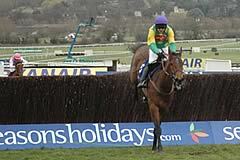 Now let’s see what March brings [and another attempt on the Seasons Holidays Queen Mother Champion Chase]. I’m not getting carried away because the 10lb helped, but he’s done it and can improve. Timmy Murphy, the 14th jockey to win in 14 races at The Open 2009, returned in triumph after Well Chief defeated a strong field for the inaugural Connaught Chase. He said: “I am delighted with Well Chief - he deserved that. “Obviously, he got 10lb from Master Minded. He jumped pretty well on the whole and acted on the ground well. “It will be a different task come March - if he did not beat Master Minded today, he was not going to beat him in March at The Festival. “Jonothan (Lower) rides him every day at home and David (Pipe the trainer) has done a great job. It is the first year for a while that they have had a clean run from the time he has come back in from grass.